MyDomain started out as a domain registrar in 1998 but has soon expanded its services to become one of the world’s leading web hosting services providers. Using reliable DNS servers and anchored on a solid hosting infrastructure, MyDomain remains a favorite option for individuals and businesses who are looking to create an impactful presence online. While there is no mention of uptime in MyDomain’s website, several monitoring sites report that MyDomain is capable of delivering 99.9% uptime. There is no mention of refund in the event of downtime. How Much Does MyDomain Cost? MyDomain offers the latest version of cPanel/WHM with their VPS hosting solutions. cPanel is a very feature-rich website hosting management application that helps even the most inexperienced individuals to attain total control over their website accounts and perform all related operations with ease. Every business has its own characteristics, and might call for a specific solution that will be adjusted to their company size, type of customers and employees and even individual niche they cater to. You should not count on finding a perfect service that will work for each company regardless of their history is. It may be a good idea to read a few MyDomain reviews first and even then you should remember what the hosting service is supposed to do for your company and your employees. Do you require a simple and intuitive hosting with only elementary features? Will you really use the advanced functionalities needed by pros and large enterprises? Are there any particular features that are especially useful for the industry you operate in? If you ask yourself these questions it will be much easier to find a reliable service that will match your budget. We realize that when you make a decision to buy Hosting Services it’s important not only to see how experts evaluate it in their reviews, but also to find out if the real people and companies that buy it are actually satisfied with the product. That’s why we’ve created our behavior-based Customer Satisfaction Algorithm™ that gathers customer reviews, comments and MyDomain reviews across a wide range of social media sites. The data is then presented in an easy to digest form showing how many people had positive and negative experience with MyDomain. With that information at hand you should be equipped to make an informed buying decision that you won’t regret. MyDomain provides telephone support and live chat as their main channels for assistance and queries. Users can browse the knowledgebase and check out the user guides for tutorials and instructions. What are MyDomain pricing details? Do you receive a free domain with their hosting plan? No. 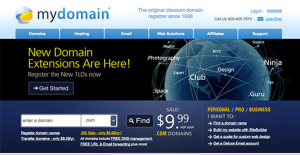 MyDomain does not offer free domains with their plans. While there is no mention of how secure MyDomain's hosting solutions are, it is assumed that it implements standard security measures to ensure that data within the network is safe and that their facilities and data centers are protected from breaches and unauthorized access. MyDomain offers Linux and Windows hosting. Is it a suitable hosting platform for Wordpress? Users can easily install and use WordPress with their MyDomain accounts. Unlimited emails is offered in premium hosting plans while MyDomain provides scalable bandwidth for most of their products. How can I pay for their services? MyDomain accepts payments via major credit cards and PayPal. Do they allow you to effortlessly design a website with no HTML or coding skills? MyDomain offers a Drag and Drop Builder package for $6.75 a month. This tool helps users create websites. It comes with personalization features, interactive widgets, and other functionalities needed to build a website from scratch. Is it a good hosting for e-commerce? Do they give you SSL, shopping carts and payment processing? Yes. MyDomain has an eCommerce hosting package loaded with the tools and features one needs in an eCommerce account including shopping carts and PayPal payment option to name a few. Do they offer an uptime guarantee and reimburse you for downtime? While there is no mention of uptime in MyDomain's website, several monitoring sites report that MyDomain is capable of delivering 99.9% uptime. There is no mention of refund in the event of downtime. We recently added an SSL certificate for our website. Sporadically we get an error that the certificate is not valid, – that it belongs to bizland.com, which is not our site. I have contacted support countless times, was told that it was being caused by several different issues, and received follow up each time saying it was fixed. This has been going on for a month. We still get the error. I try to contact via Chat, open ticket in support but no clearly answer. I think I lost money and don’t get my domain back. If you need more information about MyDomain or you simply have a question let us know what you need and we’ll forward your request directly to the vendor.